A Malaysian passenger airliner with 295 people on board crashed in Ukraine near the Russian border, Interfax cited an aviation industry source as saying on Thursday. It said the Boeing plane was flying from Amsterdam to Kuala Lumpur. Malaysia Airlines has confirmed it has lost contact with flight MH17 from Amsterdam. The Ukrainian Interior Ministry says the plane was brought down by a ground-to-air missile. 280 passengers were on board, with 15 crew. All are believed to have died. The Interfax report said the plane came down 50km (20 miles) short of entering Russian airspace. An unnamed source said it "began to drop, afterwards it was found burning on the ground on Ukrainian territory." 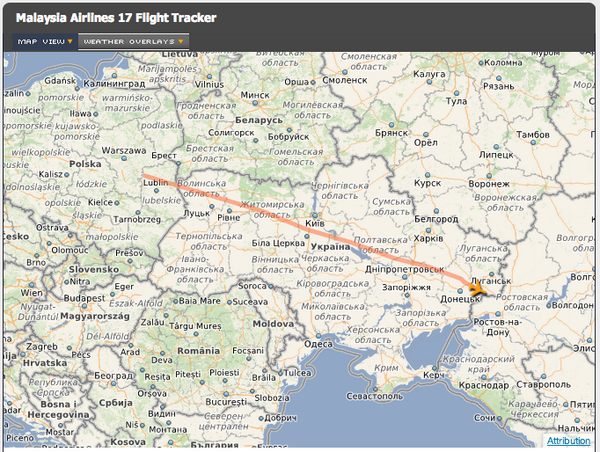 Interfax news agency says the passenger airliner was shot down at an altitude of 10km above Eastern Ukraine. A Malaysia Airlines plane has crashed in Ukraine with 295 people on board. Reports this afternoon say the passenger jet was travelling from Amsterdam to Kuala Lumpur, and is thought to have crashed near to the Russian border. The Russian Aviation Industry said the plane did not enter Russian airspace when expected, but crashed in Eastern Ukraine. It comes just over four months after the airline's Flight MH370 disappeared without trace as it flew from Kuala Lumpur to Beijing.